At your initial consultation you will meet with one of our consultants. They are trained by Dr. Agnesi to do a thorough evaluation of your hair loss and determine precisely the cost, number of procedures, and the approximate number of grafts that you will need. After determining all of the details, we will then schedule your appointment. The consultant will try their best to accommodate your schedule. The length of time that your procedure will take depends upon, among other factors, the number of grafts that you receive. The week before your surgery you will follow a specific set of pre-operative instructions. These instructions are easy to follow, but they are critical in making your procedure run smoothly. The day of your procedure, you will eat a substantial meal. This will help to ensure that your blood sugar will stay stable throughout you’re the procedure. Because the anesthetic that we use raises your metabolism, it is not uncommon to experience a drop in blood sugar during the course of your surgery. For this reason we keep a variety of snacks and soft drinks available at all times. Because a variety of factors go into determining the length of a procedure, it is often hard to estimate the amount of time needed for each patient. To avoid having you wait at the office, we prefer that patients who are scheduled in the afternoon, call us when you are getting ready to come in to make sure that we are on schedule. If for some reason we are behind, we will give you a new time to come in, usually within an hour of your originally scheduled appointment. Upon arrival, you will be asked top fill out forms (consent form, medical questionnaire, prescription info, etc.). You will meet with our doctor. He will recap what was decided at the original consultation. He will go over how many grafts you will be getting, the effect that those grafts will have on your overall appearance, the location of the grafts, and plans for future surgeries. He will also offer any recommendations that he has regarding your procedure, and how to get the best possible look. After everything has been explained, you will be taken to one of our surgical rooms. Because our procedure can be time consuming, it is at this time that we have you pick out a movie or two that you would prefer to watch to pass the time. (We have selection of movies, or you can bring your own. One of our surgical techs will prepare you for the procedure. Most patients are given 3 medications at the beginning of the procedure: a sedative to help you relax, an antibiotic to combat any infection, and a medication to help keep any swelling to a minimum. After the donor site is prepared, you will be given your initial anesthetic. We use two local anesthetics – Lidocain and Marcaine, which are similar to what a dentist uses. These local anesthetics are administered using a dental syringe. There is usually a burning sensation caused by the anesthetic. This is very short-lived and is followed by a numbing sensation. After allowing the anesthetic to take effect, the doctor will come in, remove the donor tissue and suture the donor site. When the donor tissue has been removed, it is given to surgical techs to be dissected. There is a period while the techs dissect grafts; During this time, you may have a snack, watch a movie, take a nap, Stretch your legs, etc. When a majority of the grafts have been prepared, we will begin to anesthetize the area where the grafts are going to be placed. Additional anesthetic that was used for the donor area is used for the grafted area. Although a burning sensation is felt in the grafted area, it is usually less irritating than in the donor area because the anesthetic in the donor area causes the receptor area to be slightly numb. When the doctor has made all of the sites, and a final graft count has been determined, the techs begin to place the grafts into the receptor sites. This part of the procedure can take anywhere from 30 minutes to 2 hours, depending on the number of grafts to be placed and the amount of existing hair that we have to work around. At this time, the doctor will give you your post-op medications and go over all of the directions with you. Generally, patients are given medications for swelling and a pain medication. 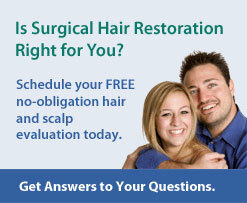 Finally, the doctor will check over all of your grafts to make sure that they are properly placed. Following surgery, we are available 24 hours a day to answer any questions that you may have.